The Huronview and Huronlea Homes for the Aged are operated by the County of Huron. Huronview Home for the Aged was established by the County in 1895, with all surrounding townships contributing to the Home’s funding. The home was located along Highway #4 in the township of Tuckersmith, south of Clinton, on a 100 acre farm. Over the years, Huronview has experienced four expansions. In 1904, the home expanded to accommodate 81 residents. An addition was added in 1953 to accommodate 60 more residents. Then in 1960 a new building was erected and became home for 310 residents. Eventually the home could no longer meet the County’s needs. 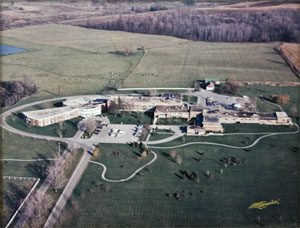 In 1993 two new Long-Term Care Homes were built – Huronview, located south of Clinton, plus Huronlea, near Brussels. Attached to these, the County of Huron constructed one and two bedroom apartments available for people 65 years and over.